This picture of the Golden Gate Bridge was taken from Baker Beach at high tide in late November, just after a rainstorm. A young woman stands in the surf, looking at the waves. You can find a lot of Golden Gate Bridge stock images online, but few that are suitable for large-sized prints. If you’re lucky, you might find a few that can be printed as big as 16 x 24 inches, but 13 x 20 is all too common – and that’s not nearly big enough for your grand vision. 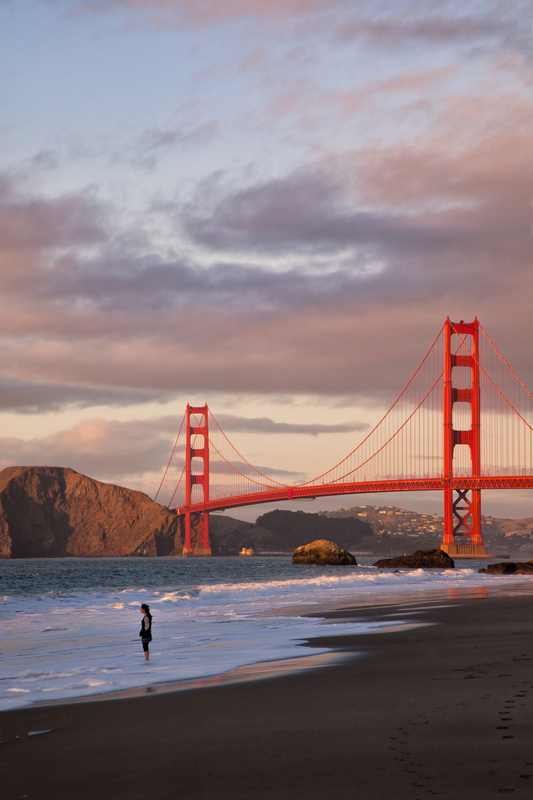 Every Golden Gate Bridge image in this collection can be used for really big prints. So far, the largest was 23 x 32 feet (7 x 10 meters). No matter how big you think “big” is, I’ll try to make it happen for you. If you’re in a rush or have a request not covered above, call or text the phone number on this page or send an e-mail. I’m in the Pacific Time Zone, USA. Unique and interesting images of the Golden Gate Bridge for all kinds of projects. If you need help finding that perfect Golden Gate Bridge shot or developing a custom solution, we invite your inquiries. That's why the contact information is on every page of this site.. Call, text or e-mail using the info in the upper left. All Images of the Golden Gate Bridge © Betsy Malloy. All rights reserved. Website © Betsy Malloy Photography 2014.